I’d been crossing my fingers that Tara of Smells Like Home would choose a cookie for this week’s Tuesdays with Dorie recipe. 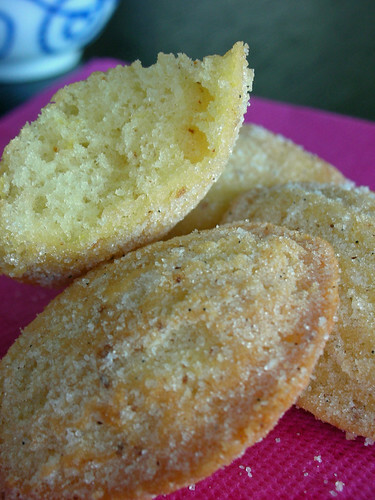 Then Tara picked Dorie’s Traditional Madeleines–score! I know that a madeleine is really cake in cookie’s clothing, but after all the hard-core desserting I’ve been doing (and still have left to do this month), I was happy to have something that’s just a sweet bite. I have fond voluntary (as opposed to Proustian-ha!) memories of these little scalloped-shaped cuties. Actually my memories are quite recent, as we made madeleines as part of the petits fours plate at the restaurant I last worked for. That recipe uses browned butter and almond flour, and we made a variety of flavors, from lavender to lemon-thyme, depending on what we felt like or what we had available. Dorie’s recipe is flavored with lemon zest, and even though she doesn’t instruct you to brown the melted butter, I went ahead and did it anyway. Browned butter just has such a beautiful flavor, I used my non-stick mini madeleine pan (which is the only one I have, and trust me, you still need to grease it well) to bake them off, and made half of Dorie’s recipe. Rather than sprinkling them with powdered sugar before serving, I tossed the still-warm madeleines in some finely ground vanilla sugar. I will say that these make very good little lemony tea cakes. They are soft and light and tasty (do bake them right when you are ready to eat them though, as they stale quickly). But I have one gripe. If we are talking about “tradition” here, then madeleines are supposed to have a bump on their backsides. We learned in culinary school that the bump is desirable, and our instructor said that madeleines are often presented with their bums in the air (rather than scalloped side up) to show them off. Dorie calls for chilling the batter for at least three hours to help form this bump. The same day I made the batter, I baked up half of it after letting it chill for several hours. No bump. The next day, I baked up the remaining batter (it had now been chilling overnight). Two madeleines had the bump…the rest didn’t. Ah well…after conferring with other TWDers, this seemed to happen to most everyone. And as Ulrike pointed out, even the Traditional Madeleines pictured in Dorie’s book don’t have bumps! If you’d like to try your hand at baking madeleines (and see if you get the coveted golden bump! ), you can find the recipe here on Smells Like Home or in Baking: From My Home to Yours by Dorie Greenspan. Don’t forget to check out the TWD Blogroll! Bumps or no bumps your madeleines look yummy! I lurve vanilla sugar! Great job! they look so fab and fluffy!!! interesting about a cake in cookie’s clothing, i have never liked madeleine’s but maybe i was eating the WRONG ones. hmmmm. Browned butter! Wish I had thought of that! They are darling, even without the bump. None of mine got them either! I’m so jealous of anyone who makes madelines; I really want a mould! Probably shouldn’t be top of my to-buy list for kitchen priorities, but never mind. These look gorgeous. Oh my. These look like heaven. I can just about feel the sugar granules crunching in my mouth. the vanilla sugar is a great idea!!! they look beautiful! Gorgeous! I’ve only had madeleines once in my life and didn’t like them but your post made me want to give them another chance. I always check your blog first because I know it will be up when it is still Monday for me. I am so impressed with your photography and wish I could eat creations. Love it! I meant to say I wish I could eat your creations. sorry that didn’t make sense! They look lovely! Great job! 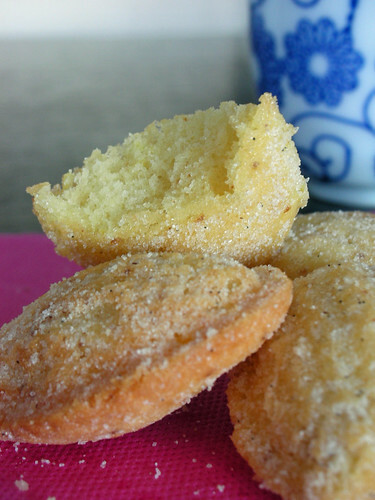 Browned butter and sprinkled with vanilla sugar – great ideas. I love how versatile this recipe is! Great photos. vanilla sugar! sounds great. Guess what? i even forgot about the powdered sugar. haha. They do look beautiful and taste wonderful fresh – but I never could get the batter to cooperate and get the bump either (tried twice). Great job! Bumps or no bump, your madeleines look absolutely delicious! looks beautiful! love the vanilla sugar, totally wish i could eat one of yours! I love your photos! Nice job! Mine didn’t bump much, either, but they were so easy and delicious that there’s no excuse not to try again soon! Ha! I am just like Mary Ann….stopping by first. it is alway so fun to see your successes and this time is no different. Woohoo! ok..off to bed now! Golden bump? With that recipe I didn’t get them either, but your shells look great! I love the sugar on them…it shimmers in the pictures. Bump or no bump I like your Madeleines! I didn’t think of browning the butter and will try that next time. I love the sugar on them yum vanilla sugar! WOW. I love the look of the vanilla sugar. I’m definitely going to use browned butter when I make these again. Great job!!! Amazing as usual. They look so pretty and I like the vanilla sugar idea. The vanilla sugar is just lovely. Well done! They look gorgeous! I love the vanilla sugar on them! wow! you baked some perfectly fluffy madelines! I want one of those! Looks like your madelines would have such a great texture. I could imagen biting into a sugar encrusted madeline, mmm. No bump for me, either, but I really goofed up the recipe, so pay me no mind! I will try these again using brown butter, because it sounds so good! Thanks for the tip! Mmmm!! They look so sugary and delicious!! I love that first pic!! Vanilla sugar is such a wonderful idea, as is the browned butter. Steph your madeleines look soooo delicious! I love the sugar on them and the idea of using browned butter! You go girl! These look so delicious! They are probably my favorite cookies. so glad i came through for you cookie wish this week! 🙂 it looks like these lovely delights turned out just perfect and i love the fact that you rolled them in vanilla sugar – heavenly! great job! You and your mad madeleine baking friends have really given me inspiration. I almost bought a madeleine pan at William Sonoma an hour ago because of all these great looking cookies on the net today! Oh my…those look HEAVENLY! I MUST try this! And, as always, beautiful pics! Yours look like they could be on a magazine cover! That first photo is THAT beautiful! I do agree with you about the bump/hump or no hump. Some of Dorie’s recipes have been inconsistent to say the least. I always question the recipes now. Yours look fantastic! Like you could take a bite right out of the computer screen. Bump or no bump, I love the idea of tossing them warm in vanilla sugar! I was nearly licking the screen! Those remind me of the fresh apple cider donuts with their sprinkling of cinnamon sugar that we get every year at apple picking. I’m sure they aren’t even close in taste, but they remind me of that happy, warm, sugary event. As usual, dainty, precious and perfect! …plus the little whimsical touch of granulated sugar adds that little “je ne sais quoi” that suits your confections so well! I’m glad you have found my translator of use this time! Not great huh? but it’s better than for me to have to write a bilingual blog (simply too much work!) Nevertheless, I’ll try to keep in mind that more English people might be reading my Tuesday posts, and will try to make it less technical and perhaps more surprising next time! 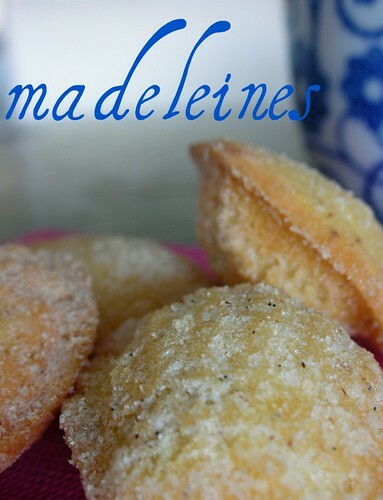 The madeleines look so delicious! Beautful photos! Love the idea of the vanilla sugar, it makes them so sparkly and cute! Mmmm, vanilla sugar! Your madeleines look delicious! I’ll have to try browning the butter next time I make madeleines. I love how yours look coated in sugar! I guess it’s just about time for me to learn how to make these. They look sooooooo yummy! That sugar is gorgeous on them. Brown butter, vanilla sugar, I’m drooling! What a great idea to brown the butter! I’ll bet the flavor was wonderful! Your madeleines look so pretty. The sugar sparkles!